To pee or not to pee, that is the question… when we get caught short in the middle of a film. It’s an age-old conundrum which can bring on a mild panic in even the most ardent cinema-goer. Do I hold it and wait it out? I don’t want to miss anything, but how long is this film anyway? Dare I get out my phone to check the time and see how long I need to cross my legs for? Also, getting up would involve shuffling past a row of other people who probably wouldn’t say anything but will definitely sigh as you try to smoothly run to the bathroom as quickly as possible. Not to mention then coming back into the darkened cinema, after being exposed to the bright fluorescent light of the bathroom, and not being able to find your seat again because your eyes haven’t adjusted, which means when you do relocate your row you’re stumbling over the people who just sighed at you on your way out, but now you have the added embarrassment of tripping over their feet and accidentally putting your hand on a stranger’s knee to keep yourself from falling over. It’s a cruel world. Who knew going to the bathroom could be so stressful? Thankfully, we’ve got the Avengers themselves to help us out, because not only are they saving the world, they’re saving our bladders too. It’s the least they can do I suppose, their next movie is over three hours long after all. Mark Ruffalo, who plays Bruce Banner/Hulk, suggested viewers could wear a diaper, as Comicbook reports. But what if you’ve got to go half an hour in? You’re sitting in your own mess for two and half hours, and no one wants that. 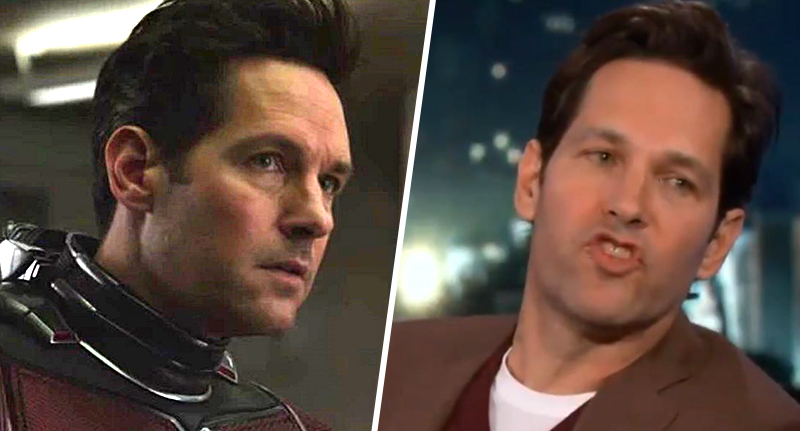 So Paul Rudd, aka Scott Lang aka Ant-Man, has suggested a different, very Paul Rudd approach to the problem. His solution? Just piss in your popcorn tub, obviously. The actor was explaining his process as he and a few other Avengers appeared on Jimmy Kimmel Live!. Well, not having seen the film, I would say get one of those giant tubs of popcorn and then just like lower it under the seat in the middle of the movie, and then you don’t have to get up. I mean, it’s not the worst thing I’ve heard of being done in the cinema. Probably better to eat the popcorn first though.